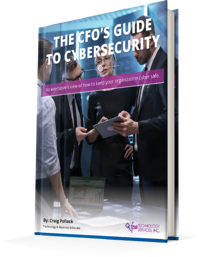 When it comes to protecting the bottom line of an organization, cybersecurity may not be a concern that is top of mind for every Chief Financial Officer (CFO). However, cyber attacks on businesses of all sizes are increasing at record levels each year. McAfee and the Center for Strategic and International Studies (CSIS) estimate that cyber attacks cost organizations and businesses worldwide between $445 and $608 billion in 2017. These staggering numbers underscore the importance of why businesses across all industries must invest in their security. Complete the form to download your free eBook to keep your company (and it's finances) cyber secure. Download our FREE eBook now and learn how to keep your company cyber secure.